A TRAINING project to help the long-term unemployed, refugees, and people with disabilities to get work has seen some participants land jobs in companies like Ryanair and Facebook. 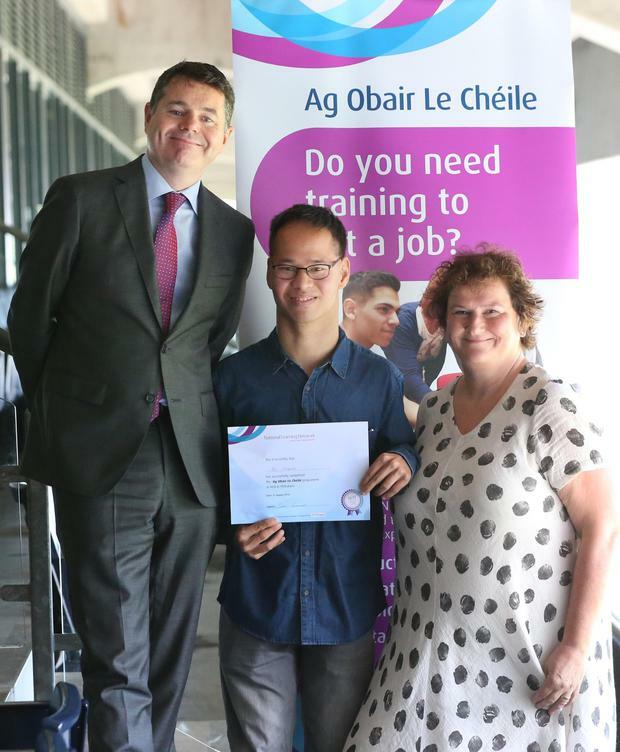 Finance Minister Paschal Donohoe was on hand to present certificates to those who took part in the Ag Obair le Chéile project. However many of the participants were unable to attend as they were working in their new jobs. The project - which also helps early school-leavers has worked with 40 people over the last 15 months, with 26 either now in a job or further education. A total of 17 are now employed, including in high-profile companies like Ryanair, auctioneers Sherry Fitzgerald and Facebook. Florin Chrican from Romania - who wasn't present at the ceremony in Croke Park - is now working for Facebook, having previously worked in construction before coming to Ireland with very little English. In a statement he said the programme helped him identify his strengths and "gave me a great level of support, encouragement and the confidence I needed to be able to apply and be successful in my new position." Nine others are in further education including completing vocational and degree level training at DCU. Mr Donohoe praised the participants in the course saying "It takes great courage to take the often difficult steps to put the foundations in place to get back to work or to education, enabling a brighter future to be built"
The training programme is run by Rehab Group's National Learning Network (NLN) in Phibsboro- and supported by investment banking company JP Morgan. The majority of the participants were referred by the Department of Social Protection, The Irish Refugee Council, Local Employment Services, Headway, Dublin North West Area Partnership and the NLN. Ag Obair Le Chéile offers personalised, one-to-one support to people who are finding it difficult to get and keep a job in areas such as Catering/Hospitality, ICT and Construction. Participants spent 60pc of their time in work placements developing the skills and experience they needed to get and keep a job. Rehab Group chief executive Mo Flynn called it a "fantastic project" they were proud to run and thanked JP Morgan for their support.